using a device that detects radio signals from minerals. was operating his device two miles from the meteorite when he detected it. 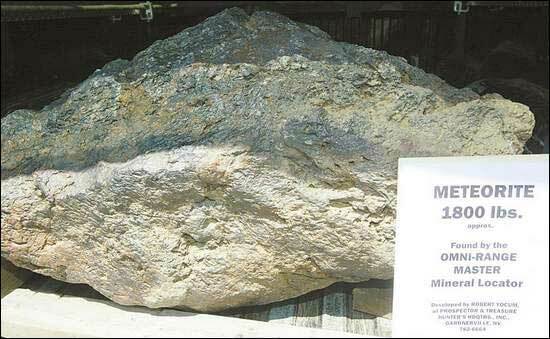 the largest hes dug up and hauled off. Getting the rock into his pickup required two comealongs. He said striations on the side of the rock indicate it was a meteorite. found, the devices antenna meet. Kernville, Calif. Yocum has lived in Northern Nevada for 17 years. an undisclosed location in Douglas County. suckered some newspaper reporter into marketing his product for him. (on eBay 5-6 years ago) located with said machine . I contacted him at that time. UCLA and was told it was not a meteorite. He sent a sample to me and I told him the same. his items were different and contained much nickel-iron. 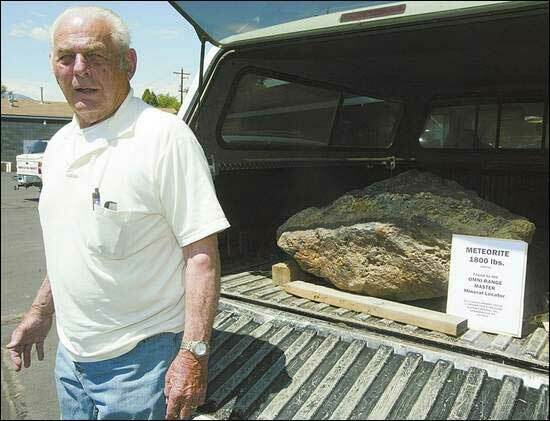 SARAH HALL/The R-C An 1800-pound meteorite was found by Bob Yocum of Gardnerville.